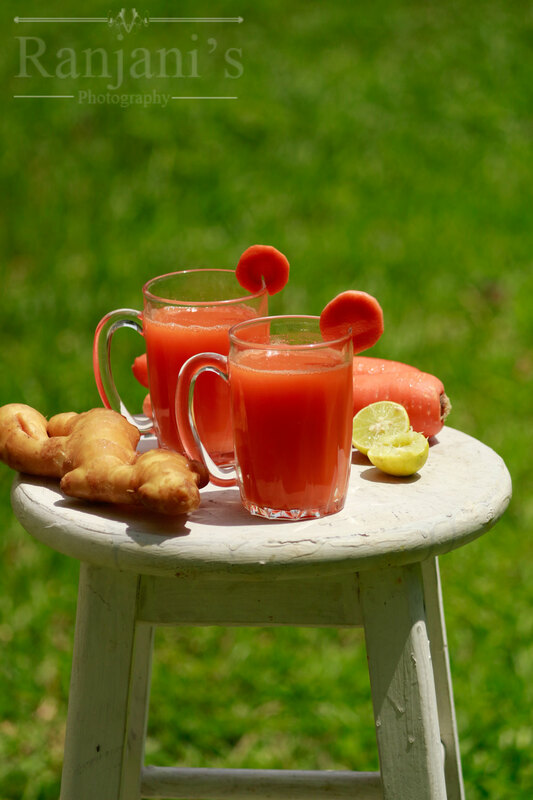 Carrot juice recipe – Healthy vegetable juice we can also call it as gajar juice. A small piece of ginger and lemon makes it more healthy and also it helps to fade out the raw veggie smell. I love the ginger lemony flavor though. Perhaps, if you are not a lover of both, you can skip and make a raw simple carrot juice. For sweetness, I added sugar. If you are diet conscious add a tsp of honey to taste. Do you want to know the benefits of drinking carrot juice? Here you go. This carrot ginger juice treats diabetes and cancer. Its good to have a juice than the intake of raw carrots. It helps to reduce cholesterol and controls heart diseases. Aids clotting of blood and cures external wounds. It improves immune power. so parents do add carrots on regular basis on your kid’s meal. The common problem among women is lack of bone health and irregular periods. The intake of carrot juice helps to regulate your period’s cycle and improve your bone health. Treat yourself with carrot juice for fair skin. Lack of vitamin A causes skin deficiency like dryness, roughness, and blemishes on the skin. The presence of vitamin A and beta-carotene improves your skin life to make it glow. So dears stop spending your hard earned money on commercially made skin products. Make use of what your mother nature gives you. Can I use carrot juice for weight loss? certainly! Carrots are rich in vitamins and minerals and low in calories and fat. So it’s a perfect vegetable drink to add to your diet plan. What’s the best time to drink carrot juice recipe for weight loss? Is it empty stomach? Of course, if you drink in empty stomach, its best start of the day. If you can’t do it, drink at any time. Wash carrots, peel off the skin using a peeler or knife, chop into small cubes for easy grinding. Peel the skin of 1-inch ginger piece. Add chopped carrots, ginger and sugar in a mixer jar. Grind to smooth paste by adding enough water. Add half lemon to it and strain the juice using a filter. Add some more water to extract the juice.